The Rock am Ring Festival in Nürburgring, Germany has been forced to shut down after receiving word of an impending terrorist attack. The action was taken after a security warning was received from the police after they received a "concrete threat" of an attack. Around 85,000 attendees were asked to leave in a "calm and controlled" way so that the venue and threat could be investigated. 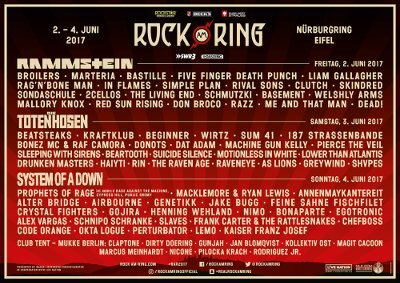 Rammstein was set to headline Friday night's lineup. Previous to the evacuation, festival goers saw sets by In Flames, Simple Plan, Five Finger Death Punch and Rag'N'Bone Man. At this time, it has not been announced if the rest of the weekend will go on as planned although organizers hope to be open on Saturday. Tomorrow's lineup includes Machine Gun Kelly, Sum 41, Pierce the Vail and Die Totten Hossen. Sunday has Alter Bridge, System of a Down, Prophets of Rage, Macklemore & Ryan Lewis and others. This is the second year in a row that the festival has seen a disruption. Last year, 30 people were hospitalized due to lightning strikes during a major storm, causing the cancellation of most of the Sunday lineup.